In his remarks Minister Rajapakshe congratulated the President of the General Assembly for convening the timely Forum noting that the present discussion will highlight the importance of full and effective implementation of the forward looking objectives States have collectively subscribed to through substantive General Assembly Resolutions for the past 20 years. 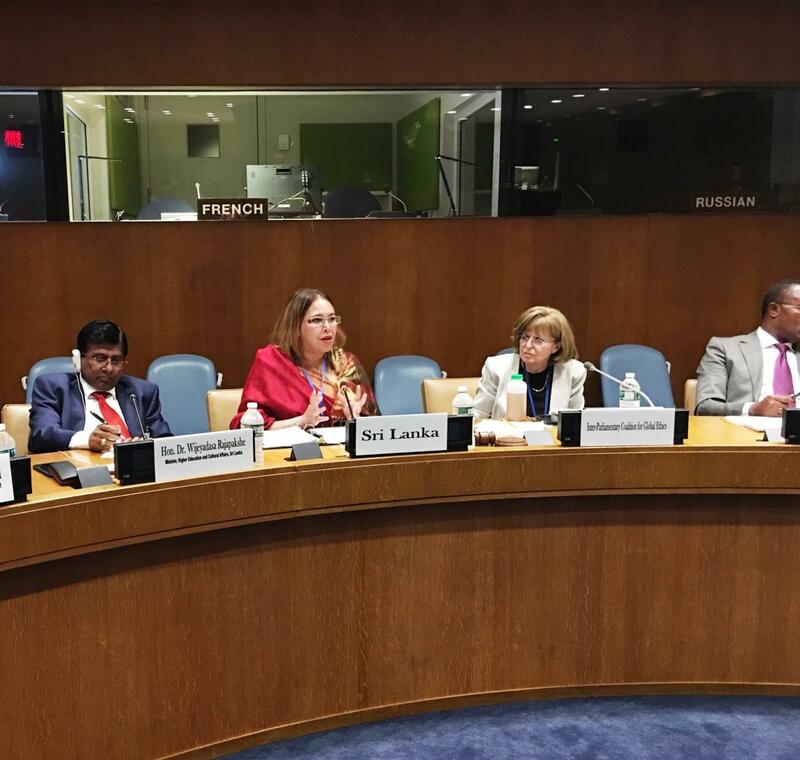 Dr. Rajapakshe also delivered the keynote address yesterday (04th September) at a Summit of Parliamentarians on the theme “The role of parliaments in promoting a culture of peace and implementing the Sustainable Development Goals” at the United Nations Head Quarters organized by the Inter Parliamentary Coalition for Global Ethics and co-hosted by the Missions of Sri Lanka and Benin. The Minister pointed out that when thinking about the role of parliaments in implementing the SDGs, we have to realize that there can be no development without peace and no peace without development. It is vital he said to understand the interlinkages between the seventeen goals of the SDGs and its underpinning by Goal 16 on building peaceful, just, and inclusive societies. Similarly the minister stressed, there can be no sustainable peace without the Rule of Law. In this regard the essence of Sustainable Development Goal 16 to promote the Rule of Law is not only a self-evident objective but also catalytic to all the Goals, he added. (Please see below for the Minister’s full keynote Address). During his visit to New York Dr. Wijeyadasa Rajapakshe paid a courtesy call on the President of the General Assembly and also participated in a roundtable discussion on the Culture of Peace at the United Nations together with several parliamentarians from Benin, Madagascar, Nigeria, Spain and France among others. on05 September 2018 from 10:30 a.m. to 01:00 p.m.
Let me first congratulate you for convening this Forum on the follow up to the Declaration and Program of Action on a Culture of Peace. 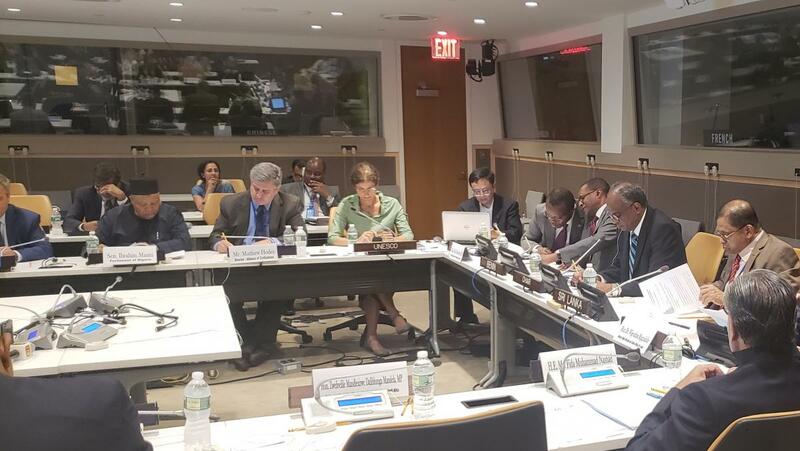 This meeting highlights the importance offulland effective implementation of the forward looking objectives we have collectively subscribed to through substantive Resolutions for the past 20 years. 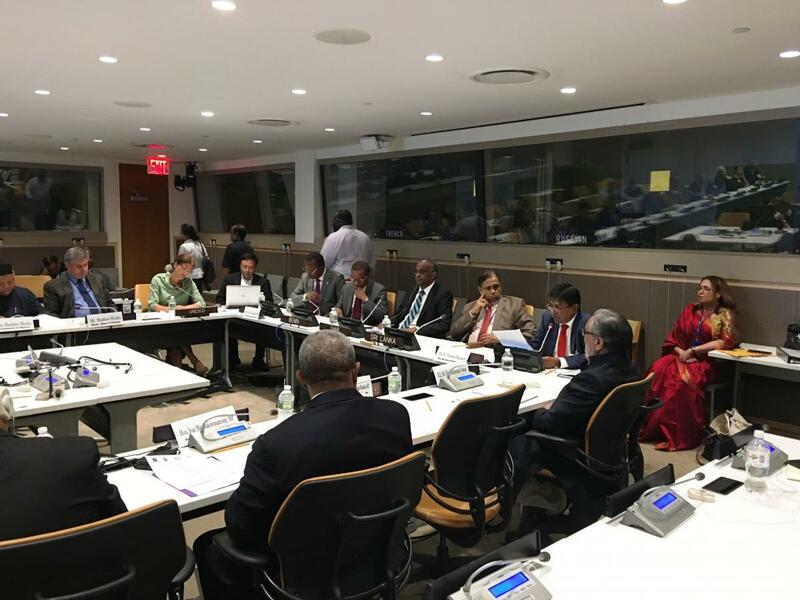 Sri Lanka asserts and re-affirms its commitment to building a culture of peace, and recognizes the need for continuous support to further strengthen this global commitment. In this regard we would like to flag some vital issues of importance in fostering a culture of peace. Firstly, despite our efforts, we still face emerging challenges such as violent extremism, migration, refugees, inequality and climate change; the impacts of which, transcends national borders and require multilateral action to solve. These challenges need to be addressed in an integrated and holistic way with the comprehensive participation of all states as well as multi stakeholders including civil society, media and the private sector.. It is vital to recognize that the most efficient way to prevent conflict is to support and sustain a strong functional multilateral system, where engagement, compromise and mutual respect for each other are key components, and where there is a genuine commitment to a common humanity while fully respecting and embracing diversity. Secondly, the 17 Sustainable Development Goals and 169 targets provides the ample tool kit for the promotion of a culture of peace and a solid framework to pursue this noble cause. The interlinkages and integrated nature of the Sustainable Development Goals especially between peace and development in Goal 4 and Goal 16 reiterates the importance of the role of peace as the foundation for sustainable and equitable development. Thirdly, it is important that Goal 5 is seen as a key component to the promotion of a culture of peace. The empowerment of women and girls and the inclusion of women in all areas of peace and security, including in peace building, peace keeping and peace negotiations is imperative for the world to move forward in peace. Fourthly it is important to underline the importance of national ownership. Establishing programs at the national and community level that raises awareness and fosters peace and tolerance; especially in a time when the rhetoric of hate and the politics of the ‘other’ has gone mainstream, is more vital than ever before. We must strive to infuse our societies with a compassion, tolerance and respect for cultural and religious pluralism as well as mutual understanding, including incorporating such awareness through education. Fifth, if we are to promote the Culture of Peace we must do so with our youth and in our schools. As the great Mahatma Gandhi said “If we are to teach real peace in this world, and if we are to carry on a real war against war, we shall have to begin with the children." Sixth, we have to take into account new and emerging trends including rapid technological advances that would impact or impede the promotion of a culture of peace. It is important that the media especially with the rise in social media tools helps disseminate the values that will foster a culture of peace and a forum for dialogue and understanding rather than a platform for hate and bigotry.We must actively seek to prevent the abuse of social media to promote the culture of racism, hate and intolerance. Sri Lanka supports and encourages the role of the media as public interest platform that seeks to turn the spotlight on prejudice. We must encourage a culture of mutual understanding and interfaith dialogue in order to empower moderate voices to take center stage. In conclusion the effort of promoting peace requires stronger joint efforts by the international community through partnerships and multi stakeholder support, especially at a time when fear and fear mongering, radicalization, terrorism and violent extremism threaten our societies. Sri Lanka remains committed to its continued engagement in this common endeavor. on 04 September 2018 from 15:00 p.m. to 06:00 p.m. There can be no development without peace and there can be no peace without development. Therefore it is vital to understand the interlinkages between the seventeen goals of the SDGs and its underpinning by Goal 16 on building peaceful, just, and inclusive societies. Similarly there can be no sustainable peace without the Rule of Law. In this regard the essence of Sustainable Development Goal 16 to promote the Rule of Law is not only a self-evident objective but also catalytic to all the Goals. For nearly three decades, Sri Lanka was unable to fulfill her true potential because our preoccupation was addressing violent conflict that tore at the very fabric of our nation. All our resources were drained to combat terrorism and violent conflict, when these resources should have been used for human development. This changed in 2015 after terrorism was defeated and a new administration elected. In order to prevent violent conflict the global community must focus on human development. We know that extremists groups actively target vulnerable and marginalized communities, children, minorities, women and girls. We have seen that those most susceptible to the false ideologies and hate speech of violent groups, are those who are most desperate, due to poverty, lack of opportunity and no foreseeable means for upward mobility. Therefore, the eradication of poverty, educational reform and increased social and economic opportunities is essential to counter human frustration and the threat of radicalization. We must approach development at local, national, regional, and international levels and construct peace-building structures in new and innovative ways. It must not be a top down approach, but rather an inclusive consultative process that carries the people with you. Visions for the future cannot be imposed on the people by an elite few; they must be shared and owned by all citizens. We in Sri Lanka have recognized the clear linkage between sustainable development and rule of law and good governance. Important constitutional amendments - for example the 19th amendment reducing Presidential powers- that was adopted following the political change in Sri Lanka in January 2015 is far reaching in the context of advancing good governance and Rule of Law and the strengthening of democracy. Comprehensive constitutional reforms that are envisaged, including the incorporation of a Bill of Rights, will further consolidate good governance and Rule of Law in Sri Lanka. This is inextricably connected to the promotion of effective, accountable and transparent institutions at all levels. After nearly thirty years of violent conflict, Sri Lanka has been able to embark on a journey towards accountability, reconciliation and a lasting peace. In these three years in office, we have been able to pass a Right to Information Act and to establish an Office of Missing Persons. In January 2016 and as an integral part of our government’s accountability and reconciliation process, an independent Consultation Task Force on Reconciliation Mechanisms (CTF) was appointed entirely driven by civil society, to conduct victim centered public consultations on the design of the four mechanisms that would advance truth, justice, reconciliation and non-recurrence in Sri Lanka. It is important to ensure that the main Institutions of the Executive, such as the Public Service and the Police remain independent, as well as the Judiciary. To guarantee this, Sri Lanka established a Constitutional Council and set up independent Commissions accountable only to Parliament for Human Rights, the Judiciary, Public Service, the Police, Bribery and Corruption etc. These are the fundamentals for creating an open society. Implementation of the Sustainable Development Goal 16 in Sri Lanka, must be seen in the context of the post-conflict reconciliation in the country. To this end Sri Lanka also established a separate ministry for the implementation of the SDGs. First, consensus is important. Sri Lanka currently has a National Unity Government. Two traditional rivals in Sri Lankan politicshave come together, ushering in a culture of consensual politics, and the return of centrists to power in Sri Lanka. In the context of post-conflict Sri Lanka, the formation of the National Unity Government, was essential in obtaining the bipartisan consensus necessary to face the challenges of peace building and Constitution reform. Second, it is vital to positively engage with the global community and the United Nations. This policy is reflected not only in our interactions with the High Commissioner for Human Rights, and the United Nations Peace building Fund, but also with the UNDP. Third, it is very important for the international community to recognize and acknowledge the efforts of a country as it addresses its past mistakes. It is also important for recurring United Nations reports, not to merely repeat the old narrative, but to reflect the ground realities and the positive changes made by a country. This raises the morale of the country and its people and closes the space for extremists to interfere with legitimate peace initiatives of a moderate government. Fourth, the root causes of the conflict lie in the economic, linguistic and social exclusion of groups. In order to build open, peaceful, just and inclusive societies it would be imperative to include women, youth, children, people with disabilities, and in particular minorities and groups in vulnerable situations. This inclusivity is enshrined in our post-conflict reconciliation process. The Global Study on the implementation of Resolution 1325 lead by former Under-Secretary-General of the United Nations, for Children and Armed Conflict Ms. Radhika Coomaraswamy, a Sri Lankan, recognized a need to further efforts to involve and support the capacity of women across the spectrum of conflict prevention and peace building. Development investments are needed to ensure that youth are provided more opportunities to contribute as a positive force for the reduction of violent conflict and the building of peaceful societies? Present day youth are increasingly susceptible to false propaganda and hate speech. Therefore the kind of development investments we make must be mainly at local levels. Improving schools, providing skill sets that will ensure a reasonable wage through vocational training institutions, providing career guidance and opportunity based seminars and interactive discussions, providing counseling to those youths in the former conflict areas, are just some of the ways we can address these issues. It is also important to foster innovation and entrepreneurship, which can sometimes be difficult to do in traditional societies. If we are to promote the Culture of Peace we must begin with our youth and in our schools. It is in this context, that Childhood Development becomes an imperative part of the conversation, in the path to peace and reconciliation that Sri Lanka now boldly treads. The aim of education is meant to prevent the encroachment of such defilements into one’s mind. As a country recovering from conflict, we remain convinced that the only way to heal the wounds of division is by inculcating the values of empathy, oneness, inclusion, forgiveness, compassion and love in our children while they are young and open to change. In addition, Sri Lanka’s Office of National Unity and Reconciliation (ONUR) is working on educational sector reform to incorporate national unity and reconciliation as a pillar within the education sector, with a view to instilling in our children the importance of plurality. ONUR is also providing training to multi-religious leaders and clergy in peacebuilding in order to use them as an early-warning mechanism to defuse potential conflict situations. 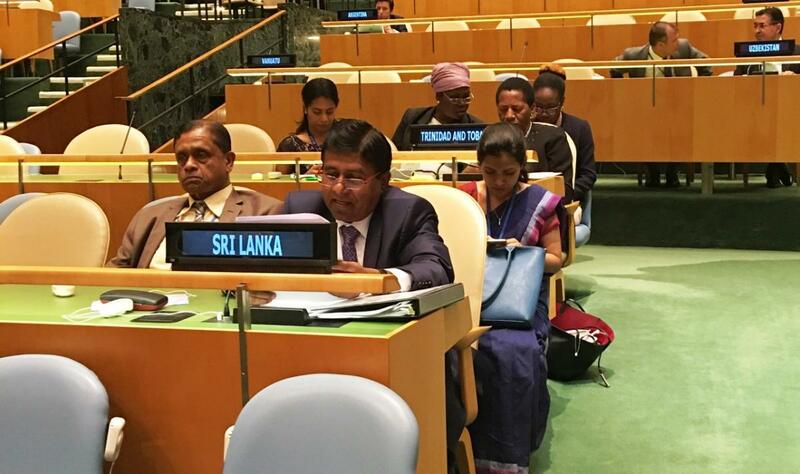 On behalf of the Permanent Mission of Sri Lanka, a cosponsor of this event at the Summit of Parliamentarians, I wish to extend a very warm welcome to you, and wish the deliberations on the role of Parliamentarians on implementing the United Nations Resolutions on aCulture of Peace all success, by way of achieving the objectives that are before you. The phenomenon of violent extremism with its linkages to terrorism, as we are all aware, is spreading with alarming speed across the global order. Itscross-frontier character demandsa collective global response. No State could effectively combat it, acting alone. Hence, the topic of terrorism and violent extremism is high on the United Nations Agenda, and in our deliberationson this issue, the need for collective measures to deal with the twin phenomenonisconstantly being emphasized. Thecurrent efforts to devise and implement a culture of peace are an important plank in addressing unprecedented rise of violent extremism. The United Nations Global Strategy to Combat Terrorism, working plan to combat violent extremism and the 2030 agenda for sustainable development goals, in particular goal 16, inter-alia to promote the rule of law, provide the overall framework for these deliberations. The special focus of this meeting is “The role of Parliamentarians for Promoting Education for the Culture of Peace and Implementing the SDGs”. The three panels that have been constituted for this evening will address key aspects of this theme. In our own reconciliation and peacebuilding efforts and promoting a culture of peace in Sri Lanka, we have paid special emphasis on sensitizing the youth and children on the inherent values of a culture of peace, inculcating thevalue of empathy, inclusion, compassion and respecting the richness of diversity, which are critical ingredients of these efforts. Education Sector reforms with emphasis on a value based education is very much part of Sri Lanka’s ongoing reconciliation and peacebuilding efforts. These aspects will no doubt be further expanded and elaborated by Hon. (Dr.) WijeyadasaRajapakshe, Minister of Higher Education & Cultural Affairs in the course of our deliberation this afternoon. The importance of the Summit of Parliamentarians is that, Parliamentarians, in their role as legislators, would strengthen at the national level, the collective efforts being taken at the United Nationsby providing the necessary legislative framework that may be required, and inject the requisite political will that would make the culture of peace a reality. I wish you fruitful deliberations,that will contribute meaningfullyto the efforts of the United Nations on ushering in a culture of peace!